You aren’t short of options when it comes to road trips along the West Coast of the United States. Highway 1 in California tends to hog all the attention, and for good reason, but the Golden State’s neighbor to the north, Oregon, has routes that can rival anything in California. Without the traffic. Driving the Oregon Coast along U.S. Route 101 is a stunning Pacific Northwest experience. Dramatic ocean vistas, mystic forests, quirky seaside hamlets, maybe a whale or two and some of the best beer you can drink – once you’re done for the day – await. You can easily spend four or five days piddling along the Oregon Coast between Washington State and California. We’re going to focus on the 160-mile strip between Cannon Beach to the north and Florence to the south. These spots are about a two-hour’s drive respectively from Portland and Eugene. The drive to the coast from each of these Oregon destinations is almost as spectacular as your drive along the coast. Almost. We’ll take a look at this fantastic West Coast road trip starting from Cannon Beach and heading south. Do those monoliths jutting out of the Pacific Ocean seem familiar? Probably. The opening scene from “The Goonies” – the car chase – takes place on Cannon Beach. Later in the movie, the 23-story-high Haystack Rock and the nearby formations called The Needles, help the gang triangulate the location One-Eyed Willie’s treasure. Unfortunately, you won’t find any underground pirate ships here, but you will find a welcoming seaside community. Inside city limits, there is the relatively unknown Haystack Hill State Park, which offers great views of the ocean after a quick hike to the top. Or better yet, try to get a good table at Wayfarer Restaurant for the best views of Haystack Rock. Given its proximity to Portland, Cannon Beach is a prime destination for weekenders heading to the coast. It gets crowded in the warmer months. On your way out of town heading south on 101, be sure to check out Hug Point State Recreation Site. Here’s where you can get your seaside underground cave fix. Not too far south of Cannon Beach, 101 cuts east away from the coast for a quick jaunt through the Oregon Coastal Range. You get to trade the ocean for some mountains, and you won’t be disappointed. Make a quick detour off of 101 at Hebo to get to Pacific City on the coast. Grab some lunch at Pelican Brewing Company. You can eat inside, on the patio or tell your server you’ll be out on the beach. Catch up with 101 just south Pacific City and continue down the coast. Unless you’ve got to use the bathroom, skip Lincoln City and make your way to Devil’s Punchbowl State Natural Area, about 5 miles south of Depoe Bay. The “punchbowl” is a beachside cave that fills up with water as waves rush in. It’s pretty dramatic. Along with this formation, the facility also provides a great vista for whale watching. You can see whales year-round, but March is supposed to be best month. If you brought your wet suit, this is also a great spot for more experienced surfers. Or, if you’re of a spectator, it’s a great spot to watch surfers get knocked around by the waves. Late afternoon is a great time to be pulling into Newport, as there are great places to grab dinner and a drink or two. You have to make a stop at the famed Rogue Ale & Spirits brewery (and distillery). Rogue Ales is one of the most popular microbrews in the States and the seaside brewpub is not to be missed. Coincidentally, if you’ve had a few too many IPAs, the brewery operates a nearby boutique hotel. There are also a number of other overnight accommodations in and around town. Stay the night if you can, Newport is an interesting city to explore, and the “coastals” (Oregon slang for people who live on the coast, think “locals”) are even more interesting. You can also find a number of campgrounds around Newport, if you’re wanting to do some SUV camping. Another good reason to stay the night in Newport is to get an early start in Yachats, about 25 miles south. Although some would argue that you’d be much better off spending the night, if not a week, in Yachats. “The Gem of the Oregon Coast” and “Home of World’s Largest Ocean,” recreational opportunities abound in Yachats. If you’re looking for things to do outside, the 804 Trail is a 7-mile stretch that connects downtown with three state parks. The Amanda Trail picks up where the 804 cuts off and can add another 3.7 miles to your hike. In town, there are quaint galleries showcasing local and regional artists, not to mention a bevy of great restaurants, including fine-dining Ona Restaurant and Lounge. But no trip to Yachats is complete without a hike up Cape Perpetua, which quickly spikes 800 feet above sea level and offers awe-inspiring views of Yachats and the Pacific Ocean itself. 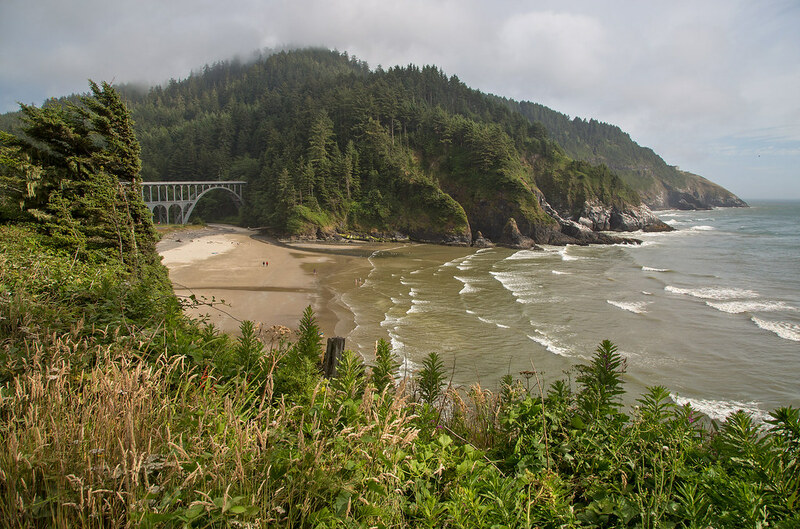 As hard as it might be to leave Yachats, the next stretch of your road trip will be the most breathtaking as U.S. 101 is sandwiched between the Pacific to the west and Siuslaw National Forest to the east. You emerge from the forest to see the most iconic item of the Oregon Coast, Heceta Head Lighthouse. If you can spare the time (and the dime), try to book a room in the adjacent bed and breakfast. They give you a flashlight to go check out the lighthouse once the sun sets. Just a clip north, before you get to the lighthouse, you get to one of the most curious parts of the Oregon Coast, the Hobbit Trails. This series of trails wanders amid a dense pine forest on its way to secluded Hobbit Beach, it’s so worn sometimes you’re actually walking under trees through their root systems. It’s not to be missed, but for some reason it isn’t marked very well. There’s a small parking pull-out off U.S. 101 at the China Creek Trailhead. If you get to the lighthouse, you’ve gone too far. From Florence, you can continue on south down the coast or cut inland on Oregon Route 126 toward Eugene. You can’t go wrong no matter which direction you choose. Robbie Clark is the editor of WheelScene.com, a car enthusiast website featuring car reviews and features, DIY repair tips and maintenance, commentary, and just about anything to do with car culture. Next ArticleWould you drive this armored SUV? WheelScene.com is a car enthusiast website featuring car reviews and features, DIY repair tips and maintenance, commentary, and just about anything to do with car culture.